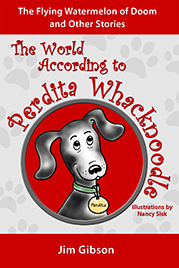 Where can you get Perdita’s books? Her books are now available for instant download to your Kindle or Kindle app on your iPad, iPhone, android device, computer, or just about anything else. You can be finding out the inside scoop on what dogs really think in less than a minute! Perdita’s first book, The Thanksgiving Pageant of Doom and Other Stories” tells you what happened when Perdita started transmitting directly into Laura’s brain–and how Laura felt about it. Then she begins to tell Laura all about her most exceptional dog family, the Whacknoodles. You’ll find stories about Uncle Bookie (and the Book of Doom), Einstein Noodle and his search for knowledge, Uncle Rip van Noodle (and how he found The Big Chill), and Par Whack’s first battle with the police and Mr. Wimpy (at The Thanksgiving Pageant of Doom). In the first book, Perdita also tries to teach Laura how to have an “intelligent” walk as she tries to improve Laura’s pathetic sense of smell. And Perdita claims to be a “professional psychologer.” You’ll be surprised at how she cures Laura of a terrible disease. By the end of this book, you’ll know that you’ve never heard of a dog like Perdita. She would completely agree. 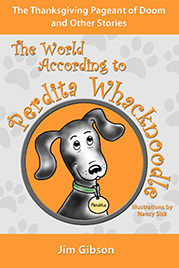 In Perdita’s second book, The Flying Watermelon of Doom and Other Stories, Perdita tells about her first (but not last!) big family vacation, how Par became a real football hero, Cousin Speedo (who wanted to set the world record for fastest dog on a skateboard), and her wise Aunt Chatty Whack. 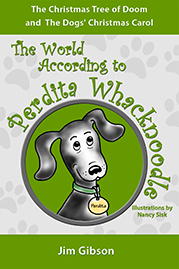 There’s a lot more, including Perdita’s unusual theories of good health and language. You’ll never look at dogs the same way again after you’ve read these books! Now, just in time for Christmas, Perdita has finished her third book–two long stories about Par’s efforts to enjoy Christmas at Farmers, and his elaborate plan to bring Christmas cheer to the people of the little mountain town of Dahlonegee. Somehow, despite all his work and plans, things didn’t go quite as Par had planned. And there were lots of explosions, though they were NOT Par’s fault. Especially the giant eruption of the bowl of mashed potatoes! Or the destruction of all the Christmas decorations in Mr. Wimpy’s yard. Really, Par didn’t start any of the problems. These are Christmas stories like no others, from a dog author like no other. But WAIT, says Perdita! Just in time for this year’s Christmas comes this new book of Whacknoodle Family Christmas stories. It’s The Christmas Hayride of Doom! THIS time Par and his best dog friends—Uncle Elvis, Woofer, and Whizzer, decide to help cheer up the people of Dahlonegee by putting on a concert at the town’s big Christmas Festival. As you know by now . . . when the Whacknoodle family is involved, ESPECIALLY when Par Whack in involved . . . a LOT can go wrong. And it may not be what you expect! But one thing is sure. THAT night is one the town will never forget. And when you read Perdita’s second Christmas book The Christmas Hayride of Doom, neither will you!